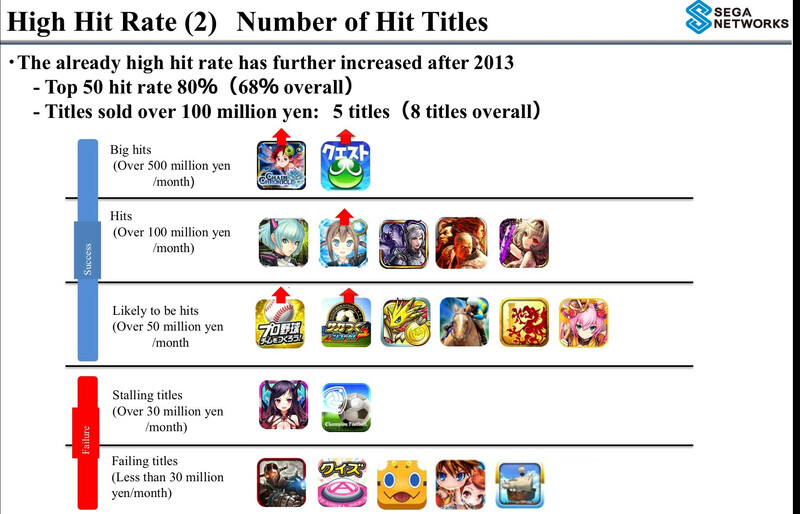 Well, in Japan they're actually making a lot of really successful mobile games and totally succeeding on that front. However, that they don't feel confident in their ability to actually take this strength and export it despite having kept up a strong digital presence in the West isn't super inspiring. Ultimately I suspect gumi will do a good job with this and Sega will likely benefit from the partnership, but the message it sends about Sega's new stature in the world is not super favorable. If this was five years ago you would basically expect the opposite to be happening, with Sega publishing a bunch of Japanese mobile games from other developers in the West. Sorry for the off-topic guys. We don't have Tsuyata + COMG rating yet, right? I think it also suggests the general difficulty in producing mobile games for traditional gaming companies. It's fairly apparent at this point that being good at making a game for the Nintendo system or the Playstation does not necessarily mean you can saunter in to the mobile business and own the place. I think a lot of people have a sense of mobile as "second class," but it clearly requires its own expertise, both in development and marketing. It's not as if mobile gaming is the minor leagues, where players from the "majors" (i.e. established PC/console developers) can expect to walk in and immediately dominate. Mobile development requires a different skillset rather than an inferior one. While I certainly agree, this one is notably a publishing side problem, which suggests the issues are not just in figuring out how to make games differently, but also how to market and distribute them differently. Ha, the million dollar question. For Japan I usually use App Annie (it requires a free account to see the charts) which gives placement information. Beyond that, we have to rely on other data sources (like analytics firms or financial reports) for more info. 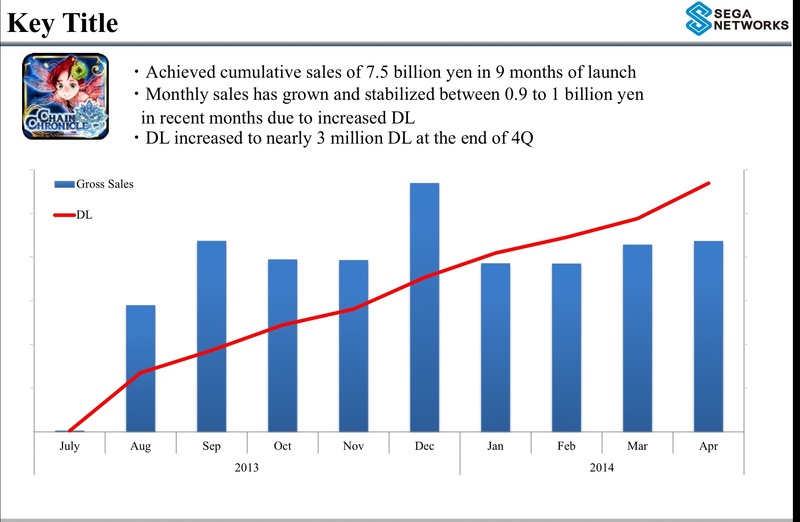 Sega put their info out recently in their financial report. The one listed as making ~$73 million in nine months is the first one gumi is publishing in the West. I think a lot of people have a sense of mobile as "second class," but it clearly requires its own expertise, both in development and marketing. It's not as if mobile gaming is the minor leagues, where players from the "majors" (i.e. established PC/console developers) can expect to talk in and dominate from day one. Mobile development requires a different skillset rather than an inferior one. It does, marketing also plays a huge role, you have to be able to differentiate yourself organically from the million billion clones likely to pop up in a matter of weeks following the initial success of a given product. It's pretty boom or bust, although I can't say consoles aren't either, with the AAA business model, which is bound to burst before too long. Let me rephrase. Major revenue changing hits. gumi reached pretty far up the top grossing charts in the US to the point where they might have been making $500K-$1 million on some individual days. I'm calling them hobo because they need gumi to publish their games in the West despite Sega having a large scale Western branch that's been in operation for vastly longer than gumi's. Like they're failing on a basic "I need to give away a healthy chunk of my profits to gumi because I don't think I can nearly as successfully launch my mobile games as well as this other company that's also Japanese and put out their first major game in the West about six months ago." level. It's not like they're lacking in local distribution arms and need someone to ship the product to stores, but rather they don't think they can handle supporting and marketing the game well through digital delivery, which is what they've restructured the entire company to focus on. Ah, I see. So they're looking to strike gold. Basically yes. And since gumi has had notable success with Brave Frontier in the West, which is an unabashedly Japanese mobile game, Sega thought they'd be the best company to partner up with. I mean the core logic is certainly sound. It just sticks out when it's gumi publishing a Sega game. Like, it would be similar to EA handing Dragon Age over to ZeniMax to publish because Skyrim shipped over 20 million copies despite EA being a much bigger company and having made major hits on that scale before, just not within the RPG category. Oh I definitely agree. That's why I said you need a different skillset "both in development and marketing." There are people who offer estimated tracking, but like NPD, they charge a ton of money. Ah, sorry, I missed that the first time. - Jamix012, for winning by units and mean error %! Mario Golf destroyed me. If I hadn't got that one so so wrong I'd be near the top. Did Mario Golf do well anywhere? It kind of feels more like what you'd expect out of a DD title in 2014, so I imagine that dragged it down. Btw, no lines for Yokai? which is the expected HW impact? I'm gonna say 45k (20k bump). Seems mostly low sales anyway. Mmmm... did I forgot to post in May? Edit: Just remembered. I was on a music festival around those days lol. Maybe that's the reason why I didn't post anything. With that business model I imagine it's a native port, but the article mentions cloud technology? Maybe that's just in regards to the phone version? I'm amazed that the 3DS can even run DQX. Mario Golf destroyed most of us, really. You just got the worst of it. Look at the GAF average. Dragon Quest XI will be on a big screen. It's not. Aeana clarified in the other thread that it's a streaming version of the game like the smartphone release. Is this the first game that can be played through streaming for 3ds, or even any nintendo console. I can only think of satellaview stuff but thats not really streaming. If it runs well, I can see it selling at least 500k. Is the Japanese market enough to keep Vita afloat? The way the device has been treated by SCEA is frustrating, but the thing seems to be chugging along in Japan. And is there a critical mass that it can hit that would force SCEA to take it more seriously? So confounding. Unfortunatley its not. Also I think SCEA would love to take vita seriously however the market and sales aren't there to make it logical. But can it run CRYSIS?! Yeah I find it odd that they're going the cloud route. I guess that makes it... an eShop title in a stretch? Speaking of Crysis, man I wish Conduit 2 came out on 3DS as it was shown to have been, could've been really neat on 3DS even if it's not GREAT. Why else would pubs keep throwing themselves on Vita? The system keeps getting stuff announced for it. SCEA has never treated the Vita as a viable platform. There were a smattering of ads at launch, but that's about it. Granted, I don't see a ton of TV ads anymore, but I haven't seen a single Vita ad in probably over a year. Mindshare is basically zero in the US. Ask the average person on the street what a PlayStation is, and I'd guess that 90% would be able to tell you. Ask them what a Vita is and you'll probably get a mix of blank stares and something about a juicer machine. Doubt it though, when there are already Smartphone and PC versions, who owns a 3DS and not have those 2? The most it can sell is probably 50k. Doubt it though, when there are already Smartphone and PC versions, who owns a 3DS and not those 2? The most it can sell is probably 50k. How many smartphone gamers play traditional games on these devices with onscreen controls? So far the performance of DQ8 and FF Agito on mobiles has been kinda disappointing, so yeah the potential on 3DS still exist. You're wrong and making me think at least 50k opening and a 200k LTD. It will be swimming long enough to get a LTD of 6 million perhaps. Lots of games to satisfy the niche while never breaking out with a mega seller. That 3DS version of Dragon Quest X is really interesting, and I certainly wasn't expecting it. Especially since it's cloud-based. It's certainly going to be VERY interesting to see how it performs. A cloud-based 3DS MMO port...what's going on in this world. 500K for DQ X on the 3ds? I doubt even SE has such lofty expectations. This is a very late, not-port, streaming subscription based mmo for a system kind of not suited for any part of that. How the game runs on the 3ds is going to be very important, but I can't see this thing clearing 100K and I imagine SE would be satisfied with that. Not really, there's already been 3 Dragon Quest games on the 3DS (2 DQ Monsters remakes, which both performed realyl well), and a Dragon Quest VII remake which sold over 1m. It's not like DQX is the first DQ game on the 3DS (unlike Monster Hunter Frontier G for the Vita). I don't think it'll change anything, to be honest. This is just Square-Enix making sure they can get as many players as possible (which is crucial for a sub-based MMORPG). Square Enix has generally been focused on bringing their service games to all feasible platforms, and actually following through on it. I suspect they will continue this trend in general. Like I would be surprised if Nosgoth doesn't show up on consoles. Just for some context, the original DQX on Wii sold about 600K copies. This is now a 2 year old port after being on the Wii U, PC & smartphones, so it'll be interesting to see how it sells. Clearly there's already a DQ audience on the platform (as witnessed with the DQ7, DQM, and DQM2 remakes and their good sales). So by necessity are we reasonably expecting DQXI is probably going to be on multiple consoles, PC and mobile in Japan? I think it is. Vita may have sold enough to be profitable but I doubt it's something Sony would want to invest into again unless something with their design changes dramatically. Why should SCEA take it seriously? I am sure Sony want all their first parties working on the PS4.....you know the product thats actually selling tremendously well and raking in money for them. It makes sense to invest more in a venture tat would lead to bigger profits. Thanks for compiling the results! It was a bad month for me. My To LoveRu Darkness Battle Ecstasy prediction punished me hard in terms of percentage accuracy, Mario Golf: World Tour not too much for the rankings since almost everybody got it wrong. It seems that Camelot Software Planning can't catch a break. Well, Mario Tennis Open didn't actually do too bad, but Golden Sun: Dark Dawn and Mario Golf: World Tour have underperformed badly, and let's not forget about We Love Golf! published by Capcom. This company has definitely seen better days. If it works how is it not suited?